Published first a few years ago in an earlier blog. Dwight David (Ike) Eisenhower was the president of my youth, age 10 to 18 approximately, but I knew nothing of and had no interest in politics at the time. I was aware that he was a Republican, whatever that was, and that my parents were also Republicans, and so I assumed, quite logically, that most of the world was Republican. I was shocked, but tried not to show it, when a classmate told me that Democrats, whatever they were, controlled both houses of Congress and that Republicans were powerless. I guess his parents were Democrats. At least we were all Baptists. The 1950’s served up the same political issues we hear about constantly in today’s news. There were budget crises, unemployment concerns, wars and threats of wars, and incessant demands for more social benefits, tax cuts, expanded civil rights, and diminished civil rights. There were power struggles and back stabbings, but there was no gridlock. Political concerns and issues were important, but national concerns seemed to have the priority, and compromises were reached, and the country moved, in the opinions of most people, forward. At the end of his first term, after two years with Democrats holding majorities in the House and Senate, Eisenhower had 70% approval and 20% disapproval ratings. Eisenhower ended US combat in Korea, which had begun under President Truman, and prevented US combat in Vietnam, which was to begin under President Kennedy. We will never know what prevented outbreak of nuclear war during the tense cold war nuclear proliferation and posturing of his administration, but many reasonably give credit to Eisenhower’s staunch positions that there would be no limited use of nuclear weapons and that if Russia were to begin nuclear war, the US would end it immediately with certain devastation of both nations. Eisenhower oversaw the construction of the St. Lawrence Seaway and the Interstate Highway System, both significant employment and economic boosters, without bankrupting the country. He launched NASA and committed to the space race. Still, he “inherited” a federal debt equal to 75% of GDP and left behind one equal to 56% of GDP. The federal deficit during Truman’s last year was about 3% of GDP, but there was a small surplus in Eisenhower’s last year. That would not happen again for forty years. Of course, those were glory days for the US economy with GDP increasing 50% from 1951 to 1959. But of course, it’s never just the president and it wasn’t just Eisenhower. It was our government in Washington that accomplished all the above with a focus on the common good and a spirit of optimism and compromise, encouraged and supported by Eisenhower’s focus on finding the middle way and avoiding extremism of any kind. Just to give full credit, this was the line-up for those eight years. Eisenhower didn’t seek the presidency as a personal ambition, probably the last not to do so, but was drafted into service, and when his term ended, he did not capitalize on the experience but asked to have his former title, General of the Army, reinstated and used that for his remaining years. In his farewell speech, he wisely warned about many of the bad things that happened to our nation in the following decades. Then, stung somewhat by the political attacks of John F. Kennedy and his declarations that, “…the torch has been passed to a new generation of Americans…,” and that a promise to, “…pay any price, bear any burden, meet any hardship, support any friend, oppose any foe, to assure the survival and success of liberty,” would replace his own approach of balance and quiet, behind the scenes, expression of America’s power, General Eisenhower returned to Gettysburg with his wife, Mamie. I guess he must have observed with dismay Kennedy’s failure at the Bay of Pigs and commitment of troops to Vietnam, and Johnson’s launch of the War on Poverty, promising that the nation could afford both guns and butter. 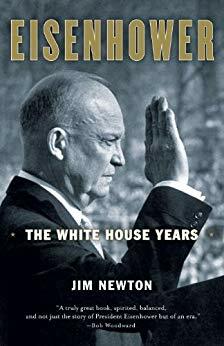 For an enjoyable overview of Eisenhower and his time, read Eisenhower: The White House Years by Jim Newton. It’s a new book, published in 2011, and is my primary source and inspiration for these thoughts on Ike.